Thanks Goddess, we have seen the last episode of Broadchurch. What. A. Shame! Rumors say that we'll be a third season, and I'm very scared! Do we really need a third season, dear Heavens? Seriously? Usually second seasons are something like a bridge between first and third, but this rule counts only if you have a story to tell. I think they have not and the second season is just the exception that proves the rule, but it's my humble opinion. Today I want to share with you my exception that proves the rule. One of the many I keept in my sleeve, of course. If you know my tastes, you should also know that I have some kind of problems wearing brown polishes on my nails. I like this shade, but I don't think it fits on me. 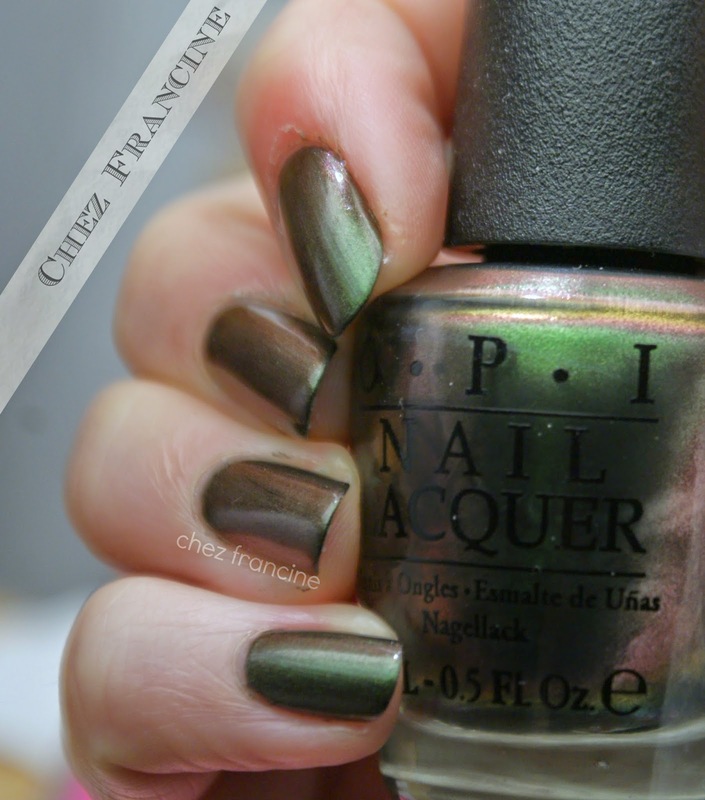 OPI Green on the Runaway is the exception that proves the rule. Grazie al Cielo, abbiamo visto l'ultima puntata di Broadchurch. Un vero peccato, hanno gestito male l'intera faccenda dall'inizio. Pare che gireranno anche una terza stagione, ed io sono piuttosto perplessa. Le seconde stagioni sono di solito dei ponti che traghettano la storia dal primo al terzo atto, ma questo vale solo se c'è una storia da raccontare. Secondo me, la seconda stagione di Broadchurch ha ampiamente dimostrato che la risposta è "no". 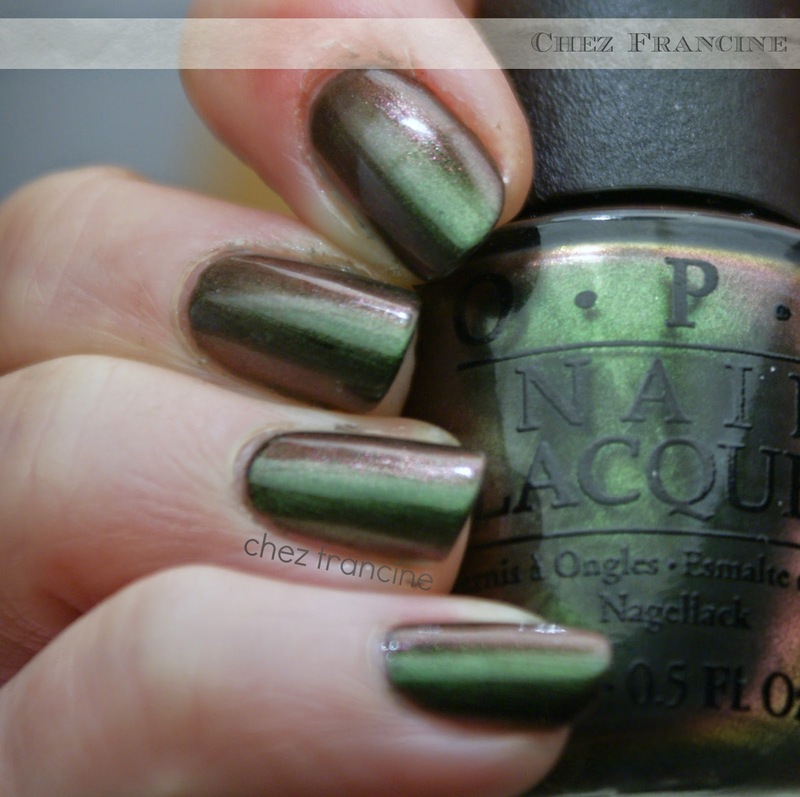 OPI Green on the Runaway is a duochrome from the Coca Cola Collection (Fall 2014). Sadly, here in Italy we have seen only the red crème and the silver chrome at Sephora stores. Ok, there's the vanilla crème too. I found this lovely gorgeous baby at Selfridges on Boxing Day in London, and I have adopted immediatly. You can see this lovely shade-shifter over two coats of Barry M Black, because you couldn't wear OPI's duochromes without a base. You can't miss the complete shift between green and red, don't you agree? 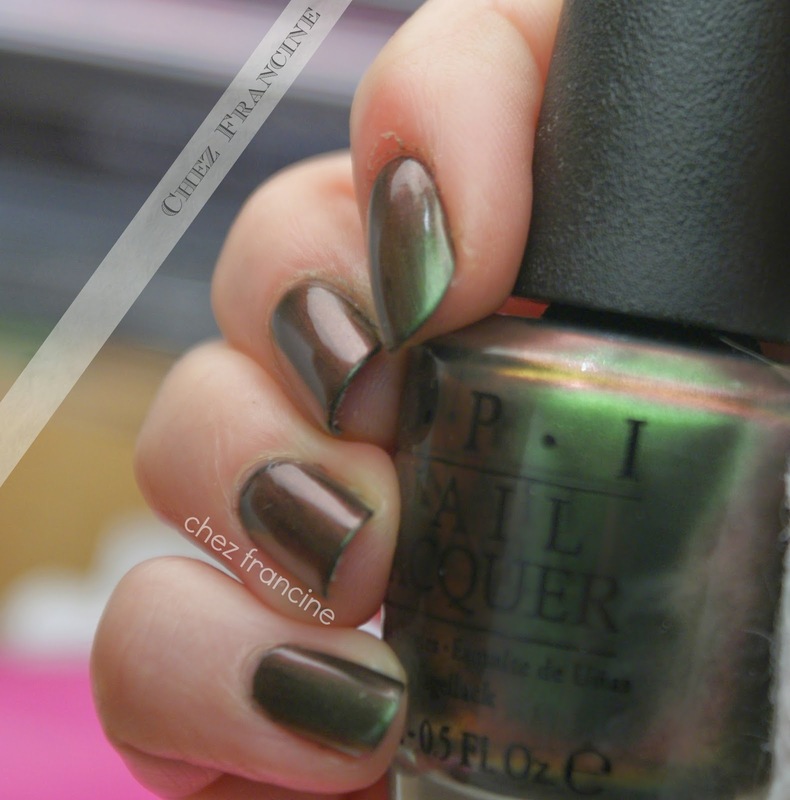 OPI Green on the Runaway è un duochrome verde/rosso che arriva dalla collezione Coca Cola (Autunno 2014); purtroppo, presso i Sephora in Italia si sono visti solo le lacche rosso e crema e il chrome argento. Ho trovato questo cucciolo durante i saldi da Selfridges a Santo Stefano e non me lo sono lasciato scappare. Qui lo vedete sopra due mani di Barry M Black; purtroppo, i duochrome di OPI sono da stendere tassativamente sopra una mutanda, altrimenti si rischia di perdere tutta la loro bellezza. I'm sorry for showing you these horrible cuticles, but I've hade some problems two week ago. The remover I've used was too aggressive and dried up my cuticles, and I have had some bendages over my right hand, so it has been difficult using the cuticle balm. I really enjoyed this lovely guy. 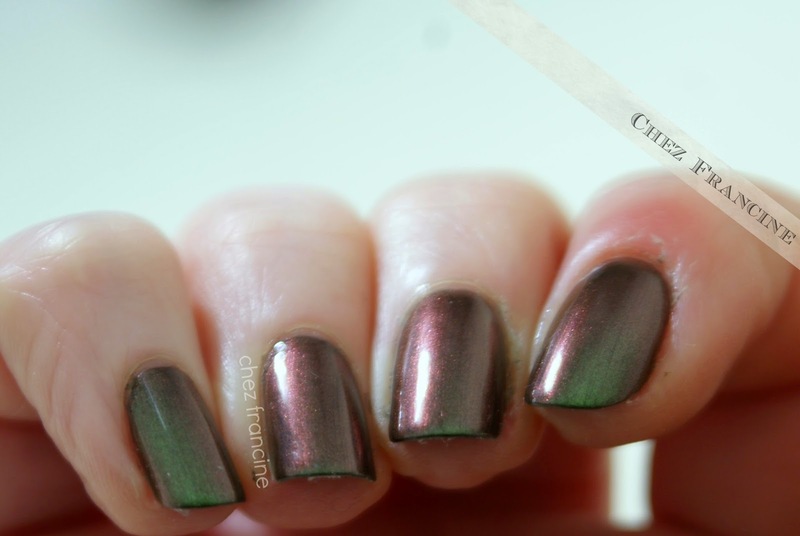 There's also a golden hint in the bottle that over your nails becomes the brown shade that has seduced me. 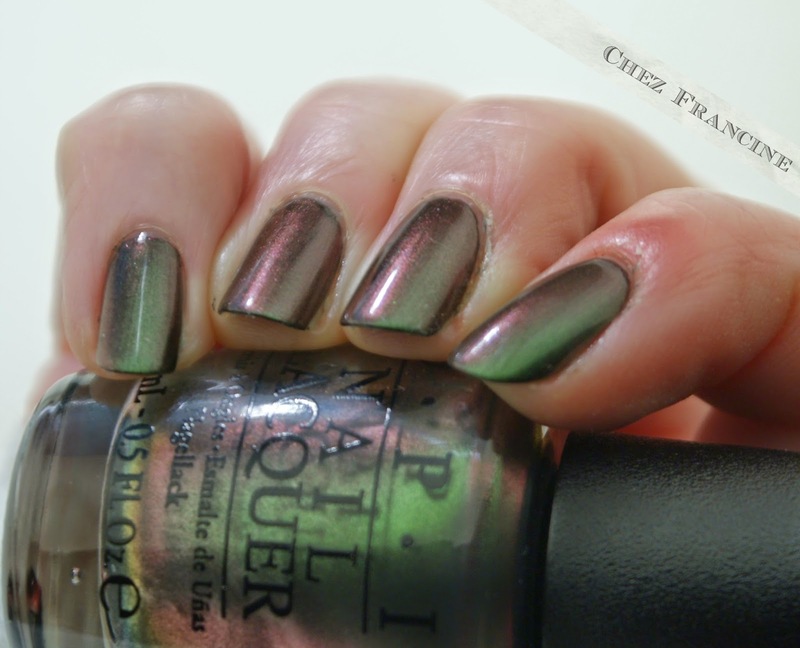 I think I'll wear it again and again and again, maybe using it as a base for a nail art (did someone said stamping?). Vi prego di non badare all'aspetto orrendo delle mie cuticole. Purtroppo, il solvente che avevo sottomano era troppo aggressivo, e siccome la scorsa settimana ho avuto l'intera mano destra fasciata, è stato un po' complicato passare la crema per le cuticole. Questo smalto mi ha conquistata! Come potete vedere, c'è anche un alone dorato in boccetta, il 'responsabile' della sfumatura marrone. Credo proprio che lo userò ancora e ancora e ancora, magari come base per una nail art (avete forse detto stamping?!). 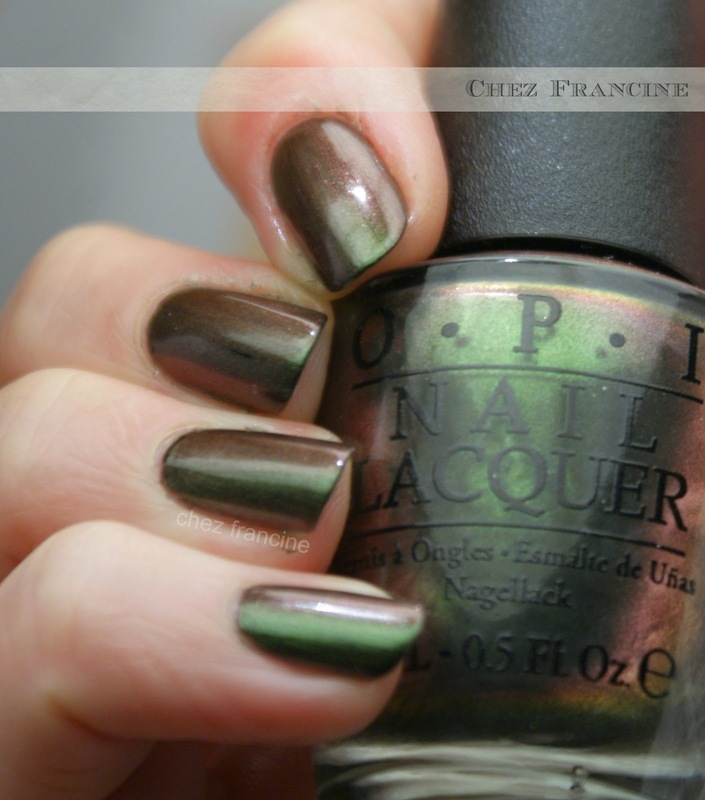 Did you have bought one of OPI Coca Cola collection? Which one? Don't forget to let me know in the comment! I hope you liked my baby (and sorry again for the gazillion of photos but this shade deserves them!) and thank you for stoping by. I'm going to see the 6 Nations match, England vs Ireland. Who's going to win? Have a nice sunday!! Avete preso uno degli smalti della Coca Cola collection? Quale? Mi raccomando, fatemelo sapere nei commenti! Spero che questo cucciolotto vi sia piaciuto (e scusate la tonnellata di foto, ma stavolta era davvero il caso di) e grazie per essere passate. Io corro a vedere la partita del Sei Nazioni, Inghilterra vs Irlanda: chi vincerà, secondo voi? Buona domenica! !